WordPress has supported the Transients API since version 2.8 but still many WordPress developers are unaware of its existence and uses. In a nutshell, WordPress Transients API lets us store key-value pairs of data with an expiration time. In this tutorial, we will cover how to use this API in depth. We will also see how it’s different from Options API, how it interacts with the WordPress caching system and few of its use cases. Most WordPress developers are aware of WordPress Options API. Options API lets us store key-value pairs of data permanently in the database. What many WordPress developers don’t realise is that Options API implements a caching layer (i.e. WordPress Object Cache) to cache the options. If a persistent cache is not enabled then a new caching session is created on every HTTP request otherwise the persistent cache is used by Options API. Almost every WordPress API interacts with MySQL using the WordPress Object Cache to cache the data to prevent multiple MySQL hits. Transients API works a little different than all the other APIs. It stores the key-value pairs of data in MySQL only if a persistent cache is not enabled otherwise it uses the Object Cache only. Whereas all other APIs use both to synchronise the data to make sure the data is persistent. Therefore Transients are not persistent i.e. shouldn’t be used to store critical data. So Transients API is great for caching data. Note: If a persistent cache is not enabled then Transients API uses Options API to store the key-value pairs of data otherwise it uses the Object Cache directly. Transients are stored in Options table. Every transient is made up of two options i.e. key-value pair data and key-value pair expiration date. Transient name(required): Must be a string. Length of the string cannot be more than 40 characters otherwise it will fail to create the transient. Transient value(required): Must be a string. If you pass a object or array then it’s serialized i.e. converted to a string. Expiration Seconds(optional): Seconds within which the transient will expire in. Transient may also expire before the expiration time because cached data (i.e. data stored in Object cache) is volatile. Here we are storing a key named ‘Website’ with value ‘SitePoint’ for 1 hour. After 1 hour the key will not be accessible anymore. set_transient returns true if the transient is created successfully otherwise it returns false. If you don’t provide an expiration time or provide ‘0’ as the expiration time then it never expires the transient. Note: If expiration time is not provided or if expiration time is ‘0’ then transients are autoloaded (i.e. loaded into memory whenever a page is requested). When set_site_transient is used with a Multi Site network then the transient is available for all the sites in the network. Whether there is a expiration time or not, transients created using set_site_transient are always auto loaded. Finally, if you run set_transient of an existing transient key, then the value and expiration time is updated with the newly provided value and expire time. The expire time is calculated from the first time the transient was set. To retrieve a stored transient you need to use get_transient function. It just takes one parameter i.e. the name of the transient. get_transient returns false if the transient is expired or is not present. Otherwise it returns the value of the transient. A transient will return false if it’s expired or not found, therefore you should never store boolean values in a transient. If you want to store boolean values then use the integers form i.e 0 or 1. If you have set a transient using set_site_transient then use get_site_transient to retrieve it instead of get_transient. To delete a transient you need to use delete_transient function. It takes only one parameter i.e. the name of the transient. It returns true if the transient was deleted successfully. If the transient is not found or due to another reason, it can’t delete the transient and then it returns false. If you have set a transient using set_site_transient then use delete_site_transient to delete it instead of delete_transient. The transients API can be used to cache anything. Most plugins use this API to cache data. For the sake of an example, let’s see how to retrieve and cache posts of a category. Here we are caching the category posts for an hour. We are retrieving the posts using WP_Query class. WP_Query is serialized and stored as a transient. While retrieving it gets deserialized. 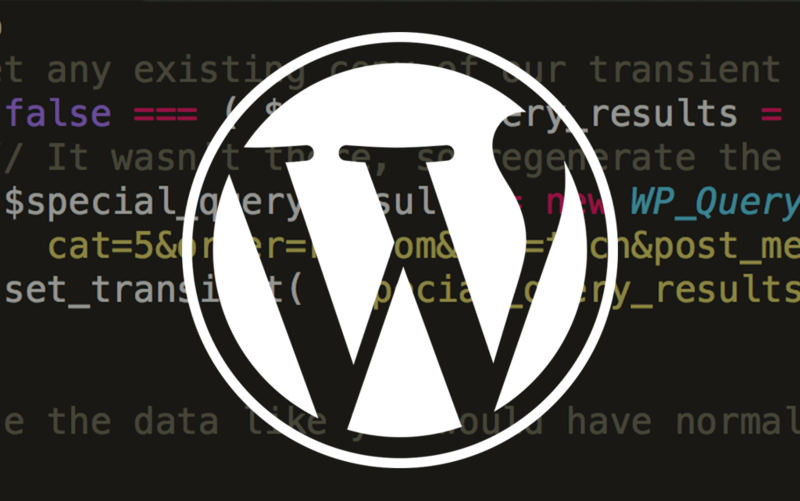 This article demonstrates how easily we can cache data in WordPress using the Transients API. You can enable a persistent cache in WordPress using either Memcached Object Cache or the WP Redis plugins. Please let me know your experiences with this API in the comments below. WordPress transients done The ezWay. Centralize your transients and treat them more like methods / functions.